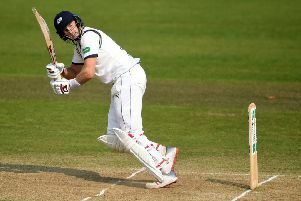 Half centuries from Chris Nash, Ben Duckett, Steven Mullaney and an undefeated 97 from Joe Clarke strengthened Nottinghamshire’s position on the third day of their Specsavers County Championship match against Yorkshire at Trent Bridge. The home side reached stumps on 329 for five, in their second innings, holding an overall advantage of 446 over Yorkshire. Clarke, who scored 112 in the first innings, ended the day within three runs of recording his second hundred of the contest but was left a little frustrated at being unable to get back on strike during the final over of play. 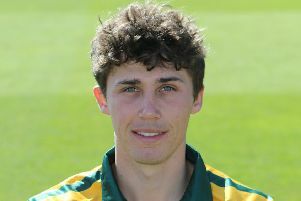 At 22 years and 316 days the former Worcestershire player, scored his runs from 125 balls, with fourteen fours, to come within touching distance of commemorating an historic landmark as the youngest to score two centuries in a match for Notts. Yorkshire’s first innings was brought to an abrupt closure during the morning, when they lost their last five wickets for 85, with Samit Patel, three for 31, taking three of them, including that of England Test captain Joe Root, for 73. Stuart Broad and Luke Fletcher also picked up three wickets each for the home county. Notts began their second innings shortly before lunch and lost Ben Slater to give Ben Coad his first wicket of the match. Through the first part of the afternoon Duckett batted positively, making 61 out of a second wicket partnership of 88 with Nash, before falling to a catch by Adam Lyth at slip off Duanne Olivier. The former Northants’ left-hander reached his 50 from only 52 deliveries, with nine fours, getting to the landmark with a reverse sweep from the bowling of Root. Duckett, who compiled a match aggregate of 298 against Cambridge MCCU last weekend, took his season tally of first class runs beyond 400 before departing. Mullaney then monopolised the scoring in the latter part of the day, plundering six fours and two sixes in his 48-ball 52 before dragging Matthew Waite onto his stumps. That left Clarke to maintain the tempo with his second impressive knock in the match. The right-hander advanced past 50 and moved smoothly towards his ton before being stranded at the non-striker’s end as Yorkshire brought in the fielders, allowing Patel to strike two boundaries in the final over. Earlier, the visitors had begun the day on 206 for five, with Root unbeaten on 56. His overnight partner Jonny Tattersall drove Fletcher for an elegant straight drive to move to nine but was then comprehensively bowled next ball, attempting a repeat. Yorkshire appeared to be chartering a course towards parity but accepted the introduction of Patel into the attack as a free invitation to play their shots. Root charged towards the spinner and swished vigorously. He would have been stumped by a country mile had the sharp turn not brushed the outside edge on its way through to Steven Mullaney at first slip. Patel’s jubilant celebration was reminiscent of one of his former team-mates, Imran Tahir. Order had barely been regained when the same combination struck twice more. Waite had helped add 38 with Root and moved on to 22 when he nicked the spinner. A slight deflection off the gloves of Tom Moores didn’t distract the Nottinghamshire captain, who then held an even better effort to dislodge Steven Patterson. The White Rose had slid from 249 for six, with Root in command, to 265 for nine. Ben Coad countered, effectively, hoisting Patel for successive sixes over extra cover to the shorter boundary before Stuart Broad grabbed the second new ball and had Olivier caught behind. Notts haven’t defeated Yorkshire at Trent Bridge in the County Championship since 2008 but are well poised to end that barren run with one day left.